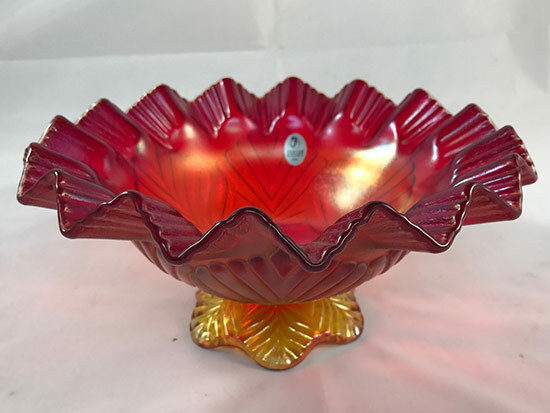 I saw a lot of carnival glass but according to my ‘tutors' (I'm just a beginner when it comes to recognizing carnival glass) most of it was overpriced or didn't have good enough iridescence to warrant any attention. 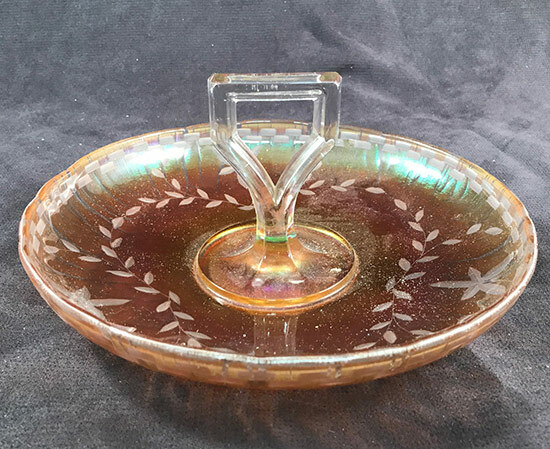 I did however pick up a few pieces of stretch glass which are fairly indicative of what we are likely to find at the outdoor shows and antique malls. BTW, I see even less stretch glass in shops than in the shows and there isn't much of it being offered for sale in the shows. 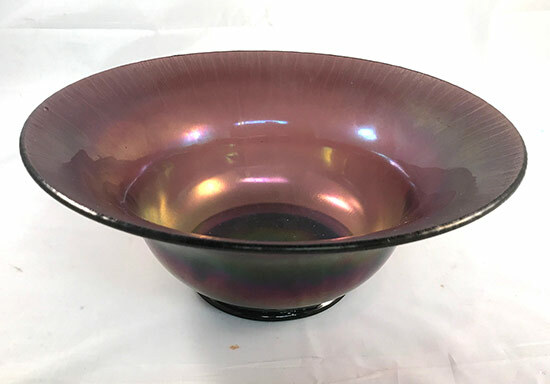 Vineland amethyst flared bowl. I like the color and the price was right. 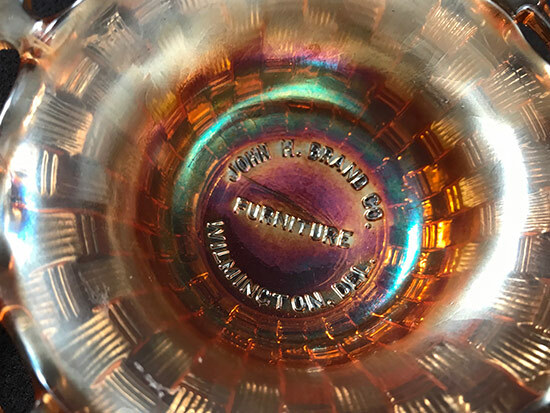 It is 10 3/4″ wide and 4 1/2″ high with a 4 3/8″ base, making it one of the larger bowls Vineland made. 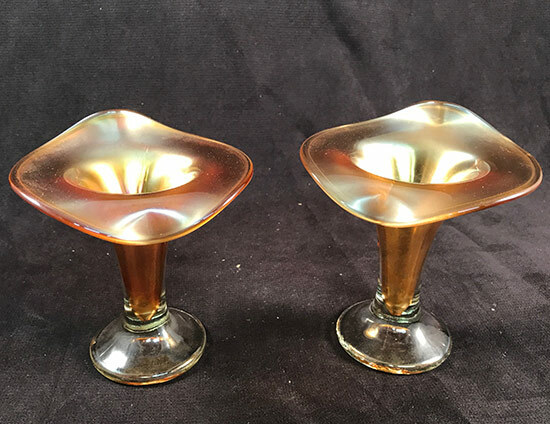 A pair of Fenton Grecian Gold #400 JIP vases. I missed these on my first trip around Renningers in Kutztown; apparently so did everyone else because they were still for sale a couple hours into the show. The asking price was $10 for the pair so I didn't ask for a better price. This Imperial nut server caught my eye because of the cutting. Imperial did a number of different cuttings on their handled servers. I didn't previously have one with this cutting but now I do. 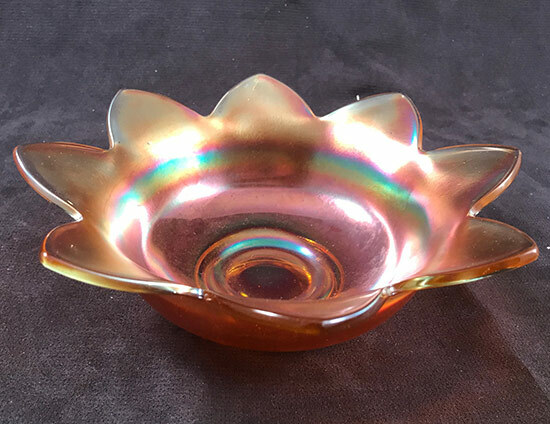 Also in Grecian Gold by Fenton was this petal bowl. This was a new color for me for this piece so I snapped it quickly. 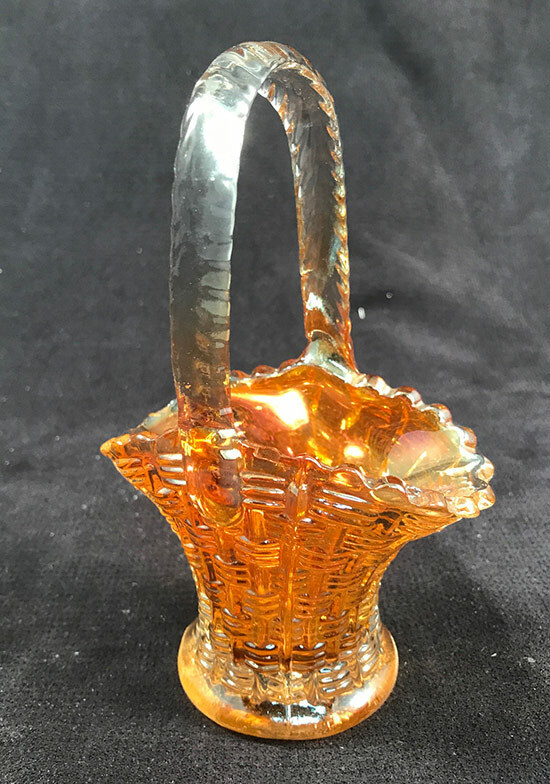 Another Fenton Grecian Gold piece being offered for sale was this center handled server with the outer edge turned up slightly. 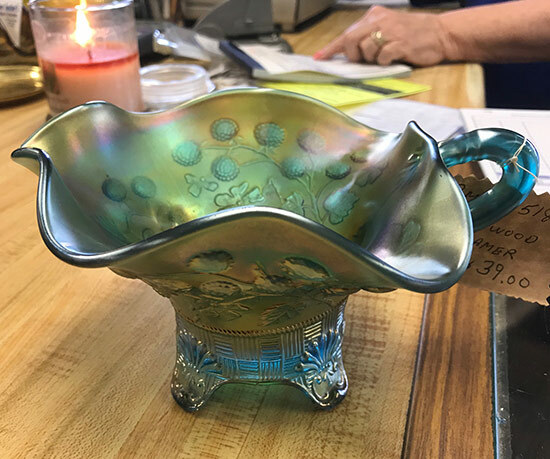 This contemporary Fenton bowl caught my eye and at $ it seemed like an okay buy. It was certainly less expensive than buying it on eBay and paying shipping. 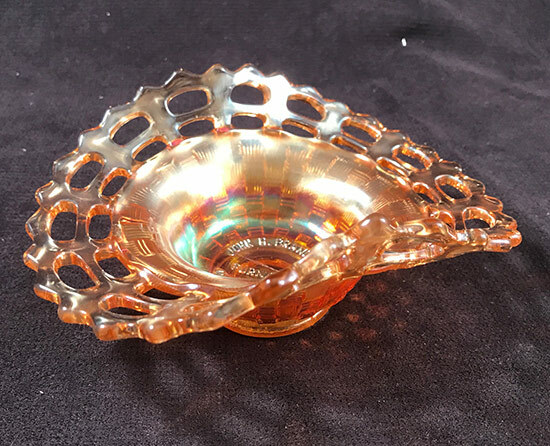 I saw the complete punch set by Fenton in “Sunset” for sale at $450. I have one but it was nice to see one for sale. I don't imagine Fenton made too many of these. 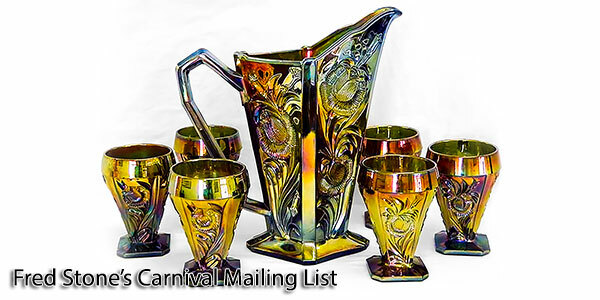 What did I buy in carnival glass? 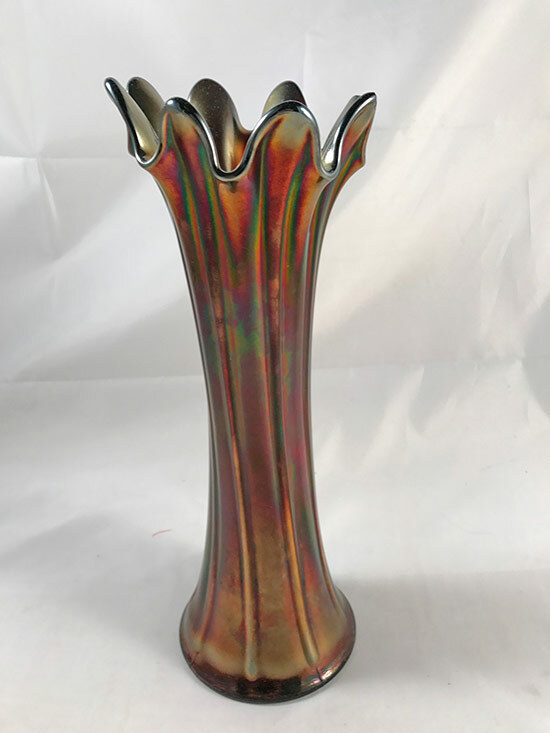 I basically buy what I like and I liked this Thin Rib vase by Northwood. …this advertising piece seemed like an okay buy at $20. I saw lots of other pieces but most of them didn't come home with me. It looks like some of you were in Kutztown also. Hope you found some goodies. At the end of the weekend I saw this Northwood piece in a shop. I nearly bought it but realized it has lots of damage to one of the feet so I passed. Should I have bought it? 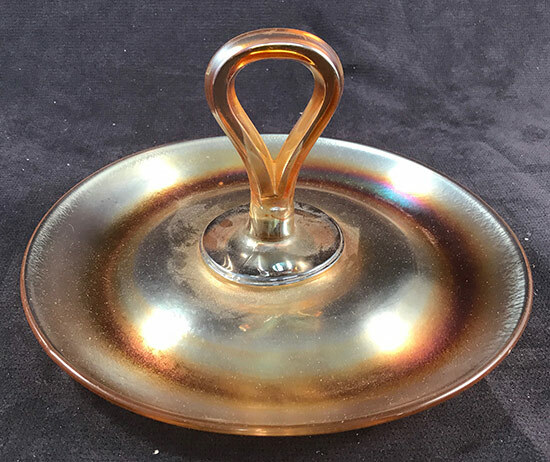 Happy hunting at Brimfield next week if you will be there. Maybe we will see each other up there.